The Koolkut KK range of Vertical Panel Saws is are HIGH VOLUME PRODUCTION machines for cutting sheet materials has been designed for medium to heavy industrial use. Intelligent design and state of the art manufacture has resulted in highly competitive pricing with enhanced ruggedness and cut quality. Central to this design are the linear shafts and sealed bearings which give life long, high precision and smooth operation whilst also resulting in major cost saving. 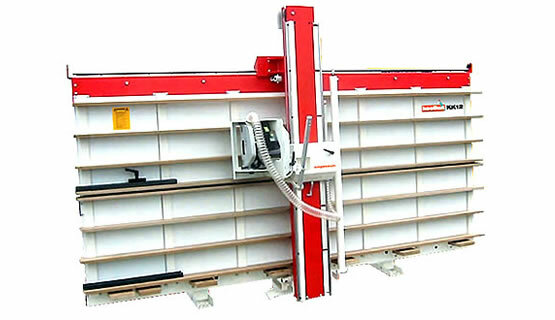 Unique to these machines are the angle cutting options which enable the cutting of simple and compound angles to the full board size of the machine. In addition to the standard cross and rip cutting functions, the KoolKut machines will also plunge and bevel cut. Each machine is equipped with an easy to use “midway” fence for cutting smaller pieces at waist height and a solid calibrated “Quick stop system” at both low and waist height for accurate dimensional cutting. Choice of blades – To suit most non-ferrous materials. KK12 up to 2.5m x 1.25m. KK16 up to 3.1m x 1.6m. KK21 up to 3.1m x 2.1m. *Sheet cutting guide per week is a rough guide. Bases on cutting 8ft x 4ft sheets of 6mm plywood.